﻿ It feels as though this album has been floating in the ether for ages now, originally announced in April and teased right the way up to its release in mid-October. And while a case like this would usually be down to labels jumping the gun on botched recording situations, this all feels like a plan to play into the hands of The Haxans, the new project spearheaded by New Years Day frontwoman Ash Costello and Matt Montgomery, perhaps better known as Rob Zombie bassist Piggy D. After all, for an album like this be released just in time for Halloween (and on Friday the 13th no less) just falls perfectly in line with this band’s intentions. In case it hadn’t been made obvious enough already, Party Monsters is deeply entrenched in the horror iconography that draws in equal measure from New Years Day’s glamorous goth songcraft and the B-movie schlock that’s commonplace on a Rob Zombie album. Still, even with the success that both members have achieved going down similar lanes in the past, there’s always a danger how much staying power this sort of thing has, and whether it’ll end up consigned to the vault to bust out every October and never else. That doesn’t seem to be the case here though, as Party Monsters is almost surprisingly solid and consistent, making liberal use of its horror iconography but never using it as a crutch or a substitution for decent writing or melody. What’s similarly surprising is how rarely The Haxans feel the need to retread ground, something this sort of music can often be criticised for. Sonically, Party Monsters averages out pop-rock, hard rock and gothic rock for a sound that isn’t exactly challenging, but has enough diversity and broad enjoyment to get by regardless. Obviously there’s a clearly hierarchy formed between such distinct sounds, the best being when the duo drop into darker, rougher territory like the growling sleaze of Black Cat Bone which is utterly insatiable, or the fuzzed-up Chains with its hollow bassline and organ interlude, but there isn’t actually much here that doesn’t warrant at least a pass. The hip-swinging electro-rock of Witch Wave has all the punch and pomp you could want from a great pop song, Young Blood and Party Time pull out neon-coated pop-rock with great success, and even on Boo!‘s towering hard rock which is more directly linked to New Years Day than almost anything else here, there’s a looseness and energy to The Haxans that brings a refreshing take to what could easily become stale in a hurry. It’s not all good though, and as is to be expected with an album brandishing its own variety so heavily, Party Monsters can occasionally veer below the watermark. Demons primarily relies on blaring, sugary synths that drown out much of the melody, and a tacked-on cover on The Misfits’ Vampira feels largely superfluous, but it’s Professional Weirdo that really leaves a sour taste, which sees Costello dipping back into New Years Day’s unflattering well of being an outcast and misunderstood. Not only is this ground that has been left barren thanks to the number of times it’s been trampled, but considering how most of Party Monsters is designed as a fun, upbeat listen in the grand tradition of horror B-movies, it feels so desperately out of place, especially with how well The Haxans do with capturing that vibe elsewhere. Costello has always had power but there’s a distinct level of personality forming here that comes from a looser, more excitable delivery, and even though Montgomery’s vocal performances amount to little more than backing work (though bringing him in for the lead on Black Cat Bone‘s second half proves an inspired choice), his deeper tones lend a sense of darkness necessary to balance out the playfulness and colour on show elsewhere. And at the end of the day, any real gripes to be had with Party Monsters aren’t exactly deal-breakers, and this still comes out as an enjoyable listen. There’s enough health in the songwriting to keep stagnation to a minimum, the embrace of variety works for the most part, and especially with regards to Costello, this is the most lively she’s sounded on record to date. None of that really bumps up the intrinsically short lifespan, but compared to other music in this vein which barely sticks around for a season, The Haxans show their capabilities to craft songs that aren’t just bogged down to Halloween playlists. Not perfect by any means, but with enough praiseworthy qualities to elevate it to a status of being a legitimately entertaining listen. 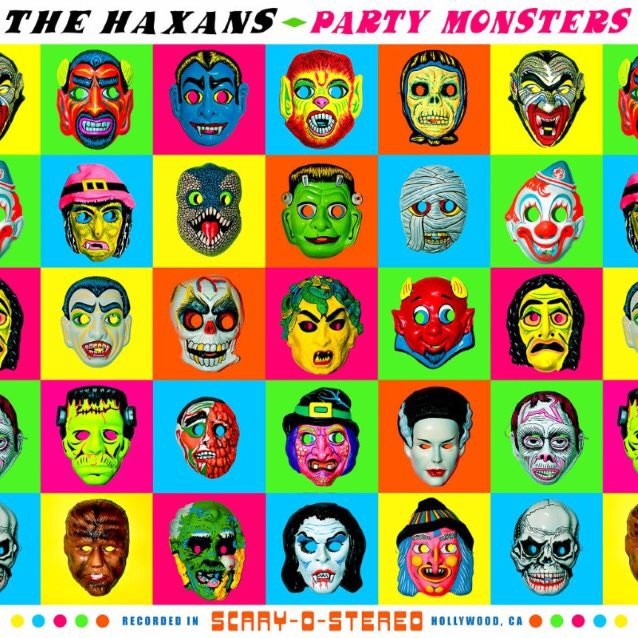 ‘Party Monsters’ by The Haxans is released on 13th October on Another Century.